The rain that normally ends California's fire season hasn't come this year. California Gov. Jerry Brown says the wildfires burning throughout Southern California are "the new normal." "This could be something that happens every year or every few years, it happens to some degree. It's just more intense, more widespread. We're about ready to have firefighting at Christmas," Brown said. And he may be right. Climate change is likely making fires worse, not just in California but all over the Western United States. Some states might even see year-round fire seasons. 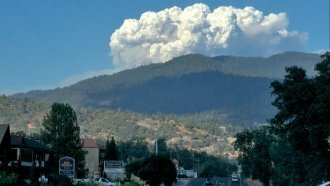 In California, fire season usually ends when fall rains hamper those flames. But those rains haven't come yet this year. That may also be the new normal as scientific models predict melting sea ice could make California a lot drier. As the ice melts, high pressure systems over the state — like the ones that caused California's recent five-year drought — will keep clouds from forming and rain from falling. As of Sunday, the six recent fires in Southern California had burned through more than 180,000 acres of land and destroyed more than 800 structures.